Thanks again for sharing yet another great recipe. Hope all is well with you and will look forward to your future messages! i think it would be dessicated sweetened coconut. great recipe! thanks! 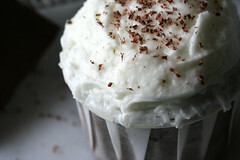 Cheryl- hooray- this is more my style- simple and chocolate- will try it! Enjoy thenext 2 months- they are busy! omgawd!! cannot wait to try this recipe. Oh goodness, coconut.. my biggest weakness. Great idea with adding the espresso powder, I love that! I may not be a big fan of coconut but I am a big fan of your site and yes… your absence has been sorely missed. Well good luck with those busy months and I eagerly anticipate when you start whipping out marvels for me to learn from again! p.s. I got into the cupcake craze only after reading yr site. Cupcakes were never this exciting till you came along! i don’t have time to bake–only to dream of time to whip up confections as lovely as yours. i look forward to every new recipe and equally delicious pix . . . nearly as good as baking and eating the cupcakes! thank you very much!!!! and please invent something new when you can. take care. One of the things I do to increase fat is add extra yolks. This helps back up a chocolatey taste as well– turning the cocoa into chocolate in a way. I imagine this recipe varies widely based on the kind of cocoa one uses. I will test this (and add extra yolks) tomorrow (11/9) and get back to you. I’, making something these days that tastes great but the middles sink when they cool. I should have mentioned! I used Valrhona cocoa which is very dark and very rich. I agree it makes a huge difference. There is nothing like the beauty of simplicity! Thank you so much for these!!! My word, I just found your website. Within five minutes, I’ve become a cupcake addict, a direct result of reading your recipes. Thank you!!! Reading your cupcake blog has truly pleased my sweet tooth. Also, I’m a fan of simple & traditional cupcake recipes. I not only enjoy baking & eating cupcakes but also enjoy amusing trivia on my fav food-Here’s some cool trivia about ‘Cupcakes’. I made these just now and they turned out terribly. I followed the directions perfectly, and the batter actually tasted great, but upon baking, the outside of the cupcakes burned and the inside remained kinda raw. I have a cupcake tray by Cuisinart so I thought it would be good quality. My frosting wasn’t so great either – the butter flavor was overwhelming and no matter what I did, I could not get it to be smooth, it just kinda formed into this weird blobby ball. I love chocolate cupcakes so much, and I’m so disappointed! Does anyone know what could have gone wrong? looks delish! love your blog!! Hi pasc,I think your oven temperature is too hot (I stand to be corrected). I had the same problem but an oven themometer resolved that problem and now my cakes turns out better. Good luck. What a gorgeous place you have here! 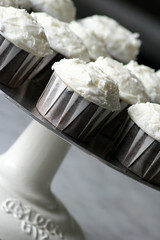 Your cupcakes look magnificently sinful and your photographs showcase them perfectly. I think I’m going to be a regular visitor, and drooler. pasc> Was the butter for your frosting truly room temp? No it wasn’t, it was still a little cold so I popped it in the microwave (bad, I know) for 10 seconds. Batter was delish…I made too batches. The first one tasted too much like coffee was a little runny and spilt over the sides. Oh my… I’m going to be sorry I found this blog. I can already imagine the need to try all of these wonderful recipes you’ve posted. I look forward to reading and eating with you! Honor, I want to thank you for answering questions and helping folks out (whoever you are). I have been under the weather so to speak and unable to keep up. Anyway, I appreciate it! Of course. Sorry to hear you haven’t been feeling well, Chockylit. I hope you’re better soon! Honor… the butter was unsalted; my friend who has worked in a bakery tasted my frosting & said it was fine, maybe I’m just not liking the butter taste. Thank you again for all your help! brilliant … coconut buttercream, sounds yummy and exotic. These look and sound perfect for a wedding too! This recipe looks great! I just found your blog and I can’t wait to see more. Hello, this is the first time I have posted anything to a blog, so here goes. But firstly, thanks for all of your lovely baking and recipes, Chockylit – yours must be a true love affair. And thanks too for all the comments from my fellow bloggers; they have been helpful. My question is: How did the frosting turn out looking so white? I can’t seem to achieve white-looking frosting even when I have used unsalted butter and creamed for longer than usual. And I’m not keen to use white fat (which this recipe incidentally doesn’t use) because I’ve tasted it, and, well, it tastes yucky. I use white fat only for greasing in sugarcraft. Can any one help? Many thanks. Hayley–it might be the vanilla. Is yours brown or clear? there’s always a room in my tummy for cupcakes! your creation is truly yummy. Thanks very much, Kristina, for your help. The vanilla extract I use is brown, but I’ve never come across clear vanilla extract, at least not here in London where I live. Do you think vanilla powder might help? I don’t even know if the powder is clear or not. I use the regular old brown vanilla. I will say that the butter I use is very pale. I have seen darker butters. It may simply be a difference between US and UK butter is my guess. My God! It’s the most beautiful blog in the world! I just used this cupcake recipe but tweaked it a bit by eliminating the espresso powder and adding a bit of sour cream for moistness and a slight more fudginess. Overall, I was very happy with the final product! I topped it with peppermint bark instead of coconut to tie in with the holidays. I have some coconut in my pantry, so I plan to give that a try this weekend! I can’t wait cause I lurvs me some coconut! Hayley–Wilton carries clear vanilla (www.wilton.com) but I don’t know how well it performs taste-wise. Love you site! Beautiful photos, yummy recipes. I made these cupcakes yesterday and they were very tasty. They looked awful though. I think I put too much batter in the cupcake papers because the batter spread out all over the top of my cupcake tin — what a mess! I wonder why they didn’t make a little dome on top. What did I do wrong? Di, I can’t be sure but that is often as a result of a too cool oven. If you haven’t purchased an oven thermometer, you might want to. At least that rules out any problems with oven temperature. My oven is fine (at least the oven thermometer says so). I think I know what I did wrong now… I did not use the instant espresso powder (’cause I didn’t have any and its not to be found in the Heartland anyway) and since the leavening was baking soda (which requires something acidic to activate its powers) the cupcakes didn’t rise. None the less, the flavor is excellent. I will try again… maybe with buttermilk? Would that work? Just want to thank you for keeping at this and say how much I appreciate your clear and comprehensive comments. I missed the Richmond connection in the original Nation article. Really do hope and expect that someday soon we’ll be reading your work, or something comperable, in the RTD. In the meantime, I’m glad we can read it here. We tried this recipe and it turned out so YUM! Thank you! I made these cupcakes for my boys – used ordinary instant coffee powder, and less of it – and they now love their mummy even more! I adore the way that these cakes stayed so light, yet managed to be so filling. And since my hubbie doesn’t particularly like coconut, it meant that the boys and I got more! Keep up the good work. I love to read this blog from rainy England and cheer myself up with thoughts of treats to come on vacation. I made these cupcakes last weekend and they were so yummy! The buttercream was just right and the cake was moist and rich and just what I’d been craving. I took a batch of them to work with me and got huge raves. Good work! I love this blog and I’m definitely going to have to try a few more of your recipes. Wow! these little babies are addictive!!! I made them for a SB party we attended, and was surprised that I had any left. my friends don’t know what they missed. I will definitely be making these “adult cupcakes” again. I may never use a boxed recipe again! I’m not the most adept person in the kitchen, but even I can pull these off. They tasted (and smelled) great every step of the way. I knew I had a winner when I tried the batter and was shocked to discover that chocolate cake batter could actually taste like chocolate. I don’t even like coconut, but somehow, this frosting charmed its way into my stomach. I’m supposed to bringing these in for a party at work–I hope they make it that long! Next up: Horchata Cupcakes! i made these today, and they spilled over the sides :( n once i took them out of the oven to cool, thinking they’ll just be gigantic cupcakes, craters formed on the top of the cupcakes leaving a yummy souffle-like cake in the cup.. in time, the cake slowly shrank away from the walls of the cup leaving not just a crater on the top, but a drain around the sides of the cake! i could hardly frost them because the frosting just kept going down the circular drain.. any tips will b greatly appreciated for i looooved the smooth chocolatey batter.. i did use scharffen berger cocoa powder as opposed to valrhona.. dunno if that made a diff..
Are u baking cupcakes everyday? Wooww…what a wonderful life!! I’ll start trying your recipe. It’s great to know your blog.. I have used this recipe twice now with fantastic results (once as cupcakes, once as a giant cupcake cake (pan from Sur la Table)!) – I omit the espresso powder due to personal preference and use 1/2 SB cocoa and 1/2 Hershey’s dark (couldn’t find V’rona). The chocolate flavor is amazing and the cake is nice and dark in color. I also prefer using a cream cheese icing but still add the coconut. Chocolate and coconut are wonderful married together! I just found your website & I love it!! I have a question about icing & thought maybe you could help me. My daughter is getting married in late June. The evening reception is outside & they don’t want a cake-they want cupcakes, which I offered to make. My concern is whether or not a buttercream icing will hold up if the weather is very warm. If not, can you suggest one that will? I bake quite a bit but have never done an outside event before. Thick buttercream holds up very well… As long as its not super hot, but then again not much will hold up in very hot weather. But up to 80 or so I would say its fine. Try to keep them out of direct sunlight if you can. Thank you so much for this recipe!!! I tried so often but my chocolate cupcakes never tasted THAT “original”. Since my fist holiday trip to the USA I´m a cupcake-fan!! But here in germany they´re not that popular yet…unfortunately! And you can´t get real good recipes here! But since I found your blog…I won´t be able to stop!!! :o) Thank you! my 12 year old son is now the baker in the family, printing this recipe for him to try! I’m 14 years old and a beginner (yet avid!) baker. I tried this recipe 2 nights ago and they came out WONDERFULLY. Made them for my parents’ cocktail party and got lots of praise. I made mini ones, baked for 12-15 minutes and got 72 cupcakes (3 batches of 24). The frosting didn’t come out quite as white as yours do in the pictures, but tasted fine regardless. Love your blog, as well as the pictures. Thanks! These look AMAZING – I’m dying to try them, but preferably w/o the espresso powder. So, if you’re around, I have a quick question – can I just omit the espresso? Or should it be replaced with something? Thanks in advance! I love love love your blog. So, so yummy. Just made these for my husband– we took one bite and both let out an “Oh my goodness” at the same time : ) Mine are definitely not as pretty (overfilled the cups a little) but they taste amazing– thank you for making us very, very happy. May I use Cappucchino instead? Don’t have Espresso..will it alter the flavor or texture? Thanks.